This is the topic for discussions about our simutrans.com site. - announce sites (fan and official ones) to be listed here. Simutrans just got a new website. And congratulations michelstadt, you are the first image of our new site. Which highlight our change to a big start image. The site now has all graphics as vectors with raster images as fallback, the vectors are even smaller than the raster images. Those vector images help complement the fact that now the site has fully responsive design, all pages will look great on you PC, tablet or phone. Internally the site is faster and even easier to maintain, as learned after those years maintaining the site. Now updating versions, changing download urls and even setting old versions as the latest for some OS is easier. It's easy to add new supported OSes as well. There are even less strings to translate. We obviously follow w3c standards for css3 & html5. The site has compatibility with IE8, somewhat works ok with IE7 and is even acceptable under IE6. If you want another image or description for your pakset under the Paksets page, just send it here and I'll update in the site. Really nice looking site, very responsive, even on my dodgy connection! Looks neat and tidy, and it's nice to see the nightly site getting advertised a bit better. The old pak page with its animated tiles was pretty; kind of a shame it's gone, although the new page looks good too. Any chance of getting the blog/forum integration back? That looked nice, especially as the front page advertises the community. Apart from those little things, nice job! Cool we have a logo guidelines page. Very professional! I'm very fond of the monochrome logos. However, Simutrans is not a registered brand, there is nothing other than politeness that keeps people from doing what we ask them not to. I think that really needs to be reflected in the wording. I.e, when we have to rely on others being polite and not abusing our logo, we also have to be polite requesting that. In the header of the brand page it is referred to the Artistic License 2.0 (AL2) and stated that it will be explained in the following what is permitted. However, what follows are non-binding desin rules, not binding license rules. Better just leave the license as is. It is very rarely if ever a good idea to summarise license texts in your own words. Who exactly holds the (so-called) intellectual property of the logo artwork? I think it is you alone? Perhaps you could consider cross-licensing it also under a fitting CC license, as (a) AL2 is not very well known, (b) a software license not that well suited for artwork. Both make it more difficult to understand what is allowed and what not. For the page i think it would be good if a different version of the logo were used. The half-round one doesn't really fit. The square one would not match very well either when centred on the page. Perhaps a longer rectangular logo? Perhaps a version where the square logo is right, 'Simutrans' left (not certain if it works at all). If you keep a white box behind a logo that needs negative space around it much less transparency is needed. For this one no transparency at all, the logo is the most prominent aspect of the page, not the screenshot. Back in 2011 when you made the wonderful logos, there was the idea to keep the sphere shaped for consistency with old logos and to indicate that a whole world is simulated or so. I think the logo is so well established now that one can do without the former, and the latter didn't work without a lot of explanation anyway. Perhaps have a slight change and go full rectangular for the main logo? The new pak page is much, much more useful. The old one was very nice, and fun to use. However, the simpler one now is just better. Bug report, the boxes do overlap for me, at a 1280x something resolution, chromium browser. Screenshot, you included it already, as it happens in your example picture as well. While these are a lot of points, this is meant as constructive criticism and suggestions. I very much appreciate what you did, it is going the right way. I fear the blog will very soon return to its dormant state. Having had the same news for 3 years on the front page was not good at all. If there were more people contributing to the blog, you would have a much stronger point though *wink*. It was too hard to make that page responsive. And this version makes looking through all the info better. I'm just looking to add the forum link better. That code slowed down the page. Thanks, I'll change together with the better wording. I went with "it's from Simutrans, it follows the Simutrans license". stormoog was the creator of the original logo, I just fixed and improved at some points. I'll need to take a look at his message to see if there's any copyright. Ok, I'll remove the dark side of the moon. I feel a bit of nostalgic for the previous page . This feature was already in the previous site. This info was added to the first post too. Okay, let's drive An_dz nuts. It begins now! This link www.simutrans.com/paksets leads to a 404 page, while www.simutrans.com/paksets/ (see the slash?) does the right thing. I'm undecided about the blog whether we should make it more visible or not. Easy fix, I forgot to remove the part of the text in one of the files. And thanks for noticing now. Ah, and it would happen with any page. Any -> "I'll just kick those boxes up there." May I Include Simutrans Indonesia FansPage ? Let me start by congratulating all for the amazing job you are doing. This is a major push to the Simutrans game, and I am confident it will pay off, bringing more users to our fantastic game! - I think the images are good, but the fact that they are behind some of the blank squares that hold the text is pretty bad presentation. - A good design would be a scroll experience, that it is common to see nowadays. I know it is a difficult implementation, but a more dynamic website give the "client" the willingness to try it out. In my opinion, "boxes" aside one another disperse the focus of the visitor. And, for someone that never heard of Simutrans is overwhelming. If I had to point a defect with Simutrans - which I sincerely love - would be that it is overwhelming. Meaning, it is too much information. You need to be focused at your best to understand the game and how it works. Simutrans has to invite people in, mainly by being simpler to the beginners. Thank you for your excellent support and work. Apart from the floating text box that I first thought was a rendering error, I really like the new look. I will provide a link for Simutrans on Steam once it is released on Steam (hopefully late February, but it depends on how much time I have to work on the Tutorial and Manual). The new design is quite nice. However, at least on my monitor the links are too bright and can be barely seen on the bright background. May I suggest to use the same shade of blue as for the titles? On my smartphone (android, nexus 5, chrome) the menu is always rolled out and blocks the page. I suppose it only ought to open when 'menu' on the top right is tapped? This does not make much sense, but I'll take a look. If you can tell me you user-agent it would make debugging easier. Does anything happen if you click on the menu button? That is very useful indeed, I didn't know it and haven't tried to leave out something that is in the middle of an url. Good to know. Other sites do as well, microsoft is one I know that do. At the top of the small-screen version of the page is a bar that stays where it is when scrolling down. It has two entries. On the left hand side bold text 'Simutrans', on the right hand side smaller and lighter text 'MENU'. Below 'MENU' is a box with entries 'ABOUT', 'DOWNLOAD', etc. This box is on my device always visible, occupying half the screen. Vertical align of the left top 'Simutrans' logo is strange in many browsers. Vertical center is better than vertical top isn't it ? Fixed, I was using a CSS that was needed on the beginning but that, even though a browser built 2 years ago supported, Chrome does not support. And thankfully not needed any more. True, I did not notice that on Vivaldi. Mostly because I developed on Opera 12 and did more in-depth tests on IE. The behaviour on Opera and IE are the correct and probably the closest to the standard. At least it makes more sense seeing how all elements align themselves. The site is now available to be translated from Simutranslator site. English and Portuguese already have all their strings translated. I made them much darker now. The titles are also darker so there's some difference between a title and a clickable element. On the help page (http://www.simutrans.com/en/help/) all the four links points to the wiki, however three of them claims they should go to the different language forums. But its a really nice webbpage! What about a "forum" button next to "help" in the upper menu which links directly to the main forum? Hum, weird. Thanks for noticing. The topbar is full, and there's a link on the footer and many around the site. Ah, didnt notice the one on the footer as I didnt scroll all the way down yet! I changed the nighly site to match better the new portal and included its strings to Simutranslator. The site now instructs your browser how to cache content, now it will ensure that you always see the updated page. And now you can download our logos from the Brand Guidelines page. Thanks Isaac for helping me on enabling ImageMagick. I hope you liked this feature. 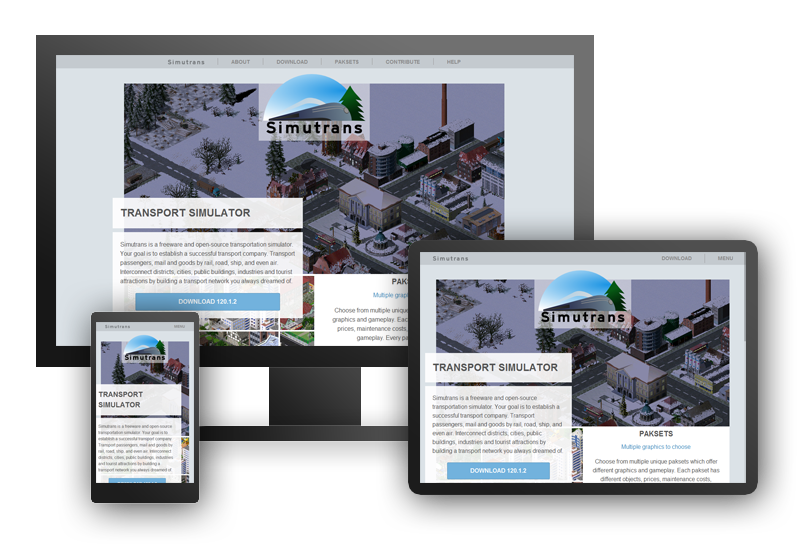 The Simutrans website was updated to let users know we are also available on Steam. 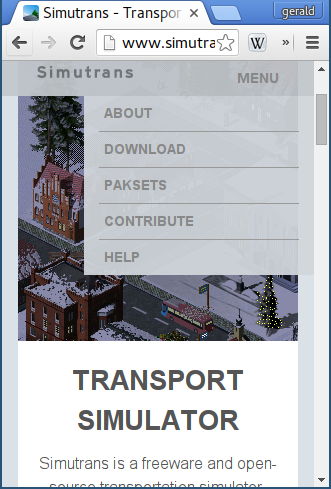 At the link you can see the info in the download page & the icon in the footer. Thanks HaydenRead for finding their brand assets. In the last month I've made a lot of invisible updates, mostly were fixes for making the code compliant to the w3c standard and end any errors in the PHP side. Anyway, two things are worth noting. Thanks to sdog the English text had some review and got better. And I've made the site more accessible adding tags and properties to help screen readers and for easy keyboard-only navigation using the WAI-ARIA standard. On Paksets page, pak192.Comics is not 0.4.1 but 0.5 since December. In general the newest pakset versions are usually encoded with the installer. Maybe it makes some sense to update the webpage for the SVN?